If you have been bitten and seriously injured by a dog, we are truly sorry for what you’ve been going through. We understand that dog attacks are very frightening and that the physical and emotional suffering afterward is intensely painful. If your child is the one who was bitten, we know that there’s a profound added dimension to your family’s suffering; as a married father of three young kids, our lead attorney David Azizi definitely empathizes with you. Please know that he and his entire team at the Law Offices of David Azizi are here to help you. 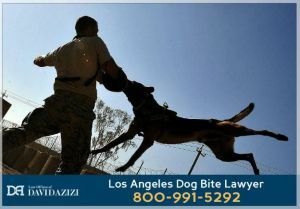 With 21 years of legal experience and a 98-percent success rate at winning cases in Greater Los Angeles, you can trust him as your dog bite attorney and rest assured that he is the best lawyer to represent you or your child. To begin a free consultation with David, call us now at 800-991-5292. We’ll connect you quickly with David, no matter what time of the day or week. He’ll discuss with you the circumstances of your accident, covering everything from where it happened, to who owns the animal, to what injuries you sustained. Afterward, he’ll be able to give you an honest assessment of whether you likely have sufficient legal grounds to proceed with a lawsuit. In other words, strict liability in California means that any dog bite is the responsibility of the owner. Whether the owner knew the dog had a tendency to be dangerous or not is immaterial. An owner, however, may use the claim of trespassing as a defense; if the dog bite victim was trespassing on private property at the time of the accident, the owner may be off the hook for a dog bite lawsuit. A keeper of a dog may also be liable as well, as David explained in the video. This legal principle could apply to a dog-sitter, or even to a landlord, if he or she is aware of a dog’s propensity to be dangerous yet does not provide adequate fencing or other safeguards. Which Dog Breeds Cause the Most Lawsuits? The frequency of pit bull and rottweiler attack cases that David has handled is also reflected in national dog bite statistics. By breed, according to the nonprofit DogsBite.org, pit bulls and rottweilers accounted for 91 percent of all fatal canine attacks in the U.S. in one recent year alone (2015), and 76 percent of such deaths over the 11-year period ending in 2015. On average, pit bulls were involved in fatal accidents once every 17 days. Tragically, it is young children and the elderly who are most vulnerable to such incidents. If you’ve been bitten by a different kind of animal that belongs to someone else, or if you’ve been injured by a dog in another fashion, David can most definitely help you, too. In one recent case, David’s client was chased by a dog that had escaped after its owner left a gate open. The client was never bitten by the animal, but he suffered serious injuries when he fell while running. David proved in court that the owner was negligent and, thus, liable for his client’s injuries. Dog owners and keepers could also be negligent in similar cases if they do not have the dog on a leash that complies with local leash laws. In both the city of Los Angeles and in Los Angeles County, for instance, animal laws require dogs to be on a leash no longer than six feet. Again, we urge you to call our offices at 800-991-5292 as soon as you can. Time is of the essence. David can then begin mobilizing his team to collect evidence while it’s still present at the scene and to interview witnesses while their memory is fresh. Potentially, they might even get to examine the dog. 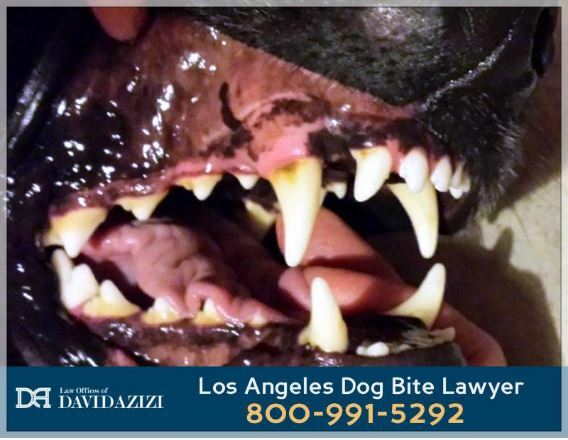 Because you’ll probably have had to pay for such dog bite treatment expenses already, David foregoes all payment for his services until he wins your case. In the unlikely event that he doesn’t, you won’t owe him a penny. However, with his experience, 98-percent success rate and level of skill, he is confident he’ll be able to help you. His peers are confident in him, too; he holds a “Superb” rating from the legal services corporation Avvo, and has been named by Expertise.com one of the Top 20 Personal Injury Lawyers in Los Angeles. The prestigious Super Lawyers organization also recently named him one of Southern California’s best attorneys for the sixth time. David knows that litigation for dog bite injuries can be confusing. He will work hard to make sure that you, as his client, know what’s coming up in the process. He will also do something most attorneys with his experience and legal stature won’t do; he will give you his cell phone number so you can ask questions as they come up. So while bites are exceedingly painful, the process of recovering your compensation doesn’t have to be. Call us today at 800-991-5292, and David will be glad to start getting you the settlement you deserve, and not one dollar less.